A health worker feeds a boy suspected of having the Ebola virus at an Ebola treatment center in Beni, Eastern Congo. The outbreak started in August of 2018 and is so far the second deadliest Ebola outbreak in history. As of today, 1,206 people have been infected and 764 people have been killed. The number of cases has grown steadily in the past three weeks, with 18 new cases of Ebola diagnosed on Wednesday and 20 new cases diagnosed on Thursday. Thirteen people died of Ebola yesterday. 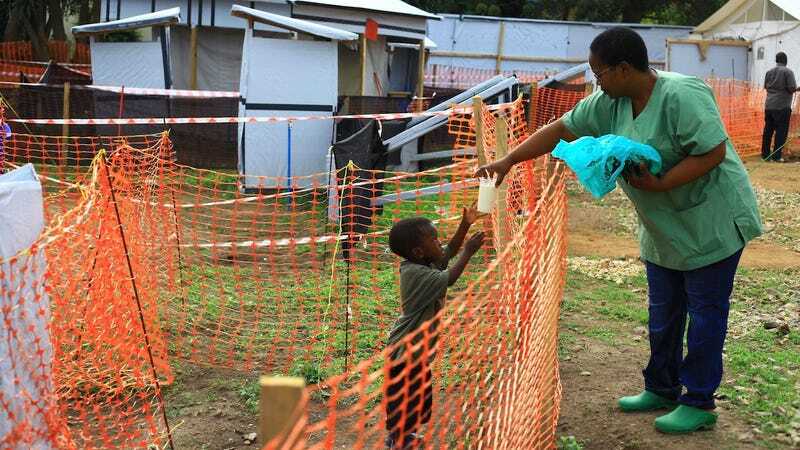 WHO assembled an emergency panel of experts in Geneva today to determine whether the Ebola outbreak, which is currently in the Democratic Republic of the Congo (DRC), should warrant a heightened international response. “Although there was great concern about some raising numbers in some regions the outbreak has not spread internationally,” Professor Robert Steffen, Chair of the Emergency Committee, said on a call with reporters this afternoon. It’s the tenth Ebola outbreak in the DRC in the past 40 years and a startling 29 percent of cases have been in kids under the age of 18. A global health emergency declaration would allow WHO to raise more money, something that’s desperately needed to fight the spread of the virus. But the WHO panel declined to do that. As health news website Stat News notes, one of the reasons that this current outbreak wasn’t declared a health emergency earlier is that it hasn’t yet spread to other countries. That remains the case after today’s decision, which is sure to disappoint a number of doctors fighting the virus in DRC. Public health workers in DRC face the rampant spread of misinformation, most strangely the idea that the Ebola crisis is simply a way to control people. Roughly 36 percent of people in the DRC believe that Ebola doesn’t even exist, according to a recent survey for the journal Lancet Infectious Diseases. And roughly 2/3 of people said that they wouldn’t take a hypothetical vaccine for Ebola. The pharmaceutical company Merck makes an experimental vaccine for Ebola called V920. Merck has shipped almost 145,000 doses of what it calls the “investigational vaccine” to the World Health Organization as of this week and estimates that 96,000 people have been vaccinated during this latest Ebola outbreak. Merck expects to donate and ship about 100,000 doses within the next few months. Trish Newport, a representative for Doctors Without Borders, told the Associated Press today that 75 percent of people who have been infected with Ebola during this current outbreak have “no obvious link to previous patients,” which means that doctors on the ground aren’t able to track how the virus is spreading. And that’s a huge problem. The current outbreak is less deadly so far than the 2014 outbreak that lasted until 2016, infecting almost 30,000 people and killing more than 11,000. As the AP notes, WHO was criticized during the last outbreak for not declaring a global health inventory earlier. It’s likely to face similar criticism for today’s decision.